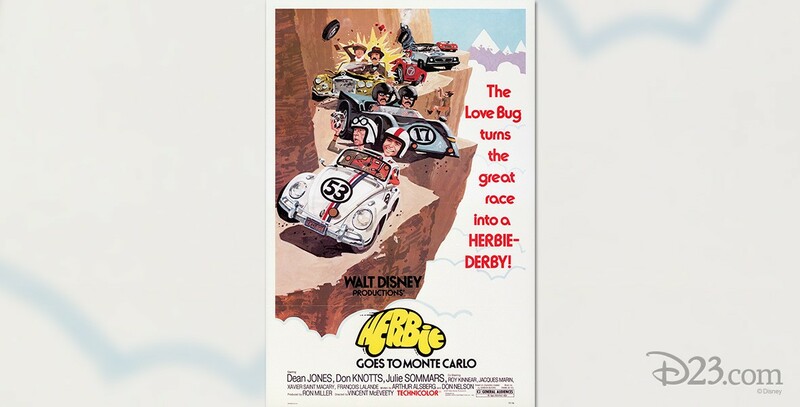 Herbie Goes to Monte Carlo (film) Driver Jim Douglas, mechanic Wheely Applegate, and Herbie, the magical little VW, enter a spectacular road race from Paris to Monte Carlo. One of the competing cars is a beautiful powder blue Lancia named Giselle. For Herbie it is love at first sight. Jim falls for the Lancia’s pretty driver, Diane. Meanwhile, a fabulous diamond is stolen from a museum by two thieves and hidden in Herbie’s gas tank. Throughout the race the thieves try to recover the gem. With Herbie’s help, the thieves are caught, Herbie wins the race, and he and Jim both get their girls. Released on June 24, 1977. Directed by Vincent McEveety. 113 min. Stars Dean Jones (Jim Douglas), Don Knotts (Wheely Applegate), Julie Sommars (Diane), Jacques Marin (Inspector Bouchet), Roy Kinnear (Quincey), Bernard Fox (Max), Eric Braeden (Bruno). The film was shot on location in France en route to Monte Carlo and in Paris at the Esplanade du Trocadero, Eiffel Tower, Place de la Concorde, Place Vendôme, Place d’Iéna, Arc de Triomphe, and down the Champs-Elysées at 80 miles an hour. Released on video in 1984.